Mike F. submitted this photo and caption. I am a member of the Cadets marching staff and I live in Toronto, Ontario. Here is a photo found in the Toronto city archives. 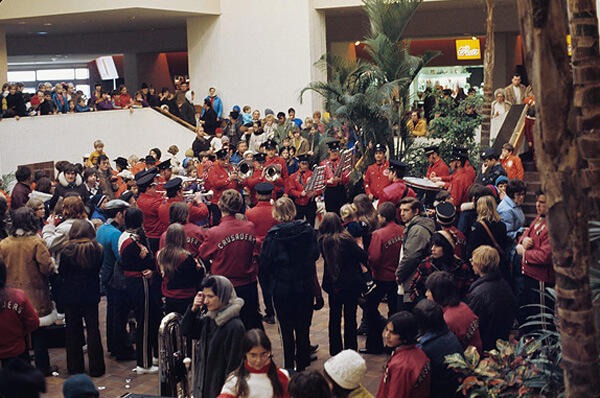 The photo comes from the grand opening of a mall in Toronto called Sherway Gardens in 1972. If you look at the photo you'll see some Crusaders jackets, a contra bass and a group of brass players performing. Sherway Gardens is in the Etobicoke part of Toronto and I can assume that the Crusaders jackets are for the Etobicoke/Oakland Crusaders, the legendary Toronto drum corps of years past. I wonder if any drum corps fans out there know anymore information on the picture.